If you help care for your aging Appleton senior parent, then you’ve probably heard the importance of taking preventative measures against pneumonia. That’s because Appleton seniors are much more prone to catching the illness. In fact, according to a 2009 study, the annual incidence of pneumonia among adults over 65 is four times that of younger populations. Read our FAQs to learn why and get tips to identify pneumonia symptoms and ensure a speedy recovery for your parent. Pneumonia is an infection (viral, bacterial, or fungal) of the lungs. Cases can range in severity. Milder cases sometimes get referred to as “walking” pneumonia because the infected person doesn’t have to stay in bed. More severe cases require bedrest. While symptoms like chills, shortness of breath, and chest pain will stand out to younger individuals, they may register as fairly typical among seniors, given their already weakened immune response. As a result, a senior may not even notice the signs of pneumonia, and thus may not seek help. 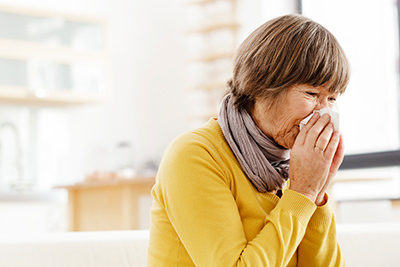 Residing in an assisted living community or nursing home puts your Appleton senior parent at greater risk of contracting pneumonia due to the close proximity of potentially infected residents, visitors, and workers. This is known as community-acquired pneumonia (CAP). Seniors are more likely to have other conditions, such as heart disease or COPD, that when combined with pneumonia can create dangerous complications and even death. Even a mild case of pneumonia can further weaken a senior’s already weak immune system, which can turn an underlying condition, such as heart disease, into a life-threatening malady. However, as noted above, symptoms may go unnoticed in a senior who might experience these conditions on a normal, healthy day. "The symptoms and signs are sometimes not as specific,” says Dr. Joseph Mylotte, a professor of medicine at the School of Medicine and Biomedical Sciences at the University of Buffalo, (via A Place for Mom). “They may be more sleepy and lethargic, or lose their appetites, or they may suffer from dizziness and fall." To help your Appleton senior parent feel more comfortable, you can give him or her over-the-counter medicines for fever and chills. Exercise caution with cough medicines, however, as coughing helps expel mucus to rid the lungs of the infection. You don’t want to suppress coughing entirely, but if it’s keeping your parent up at night, you can get a cough suppressant prescription. BrightStar Home Care of Appleton and Waupaca area proudly provides medical staffing, skilled nursing and non-medical in home care for seniors and children, including a passion for elder care companionship and supportive services in Outagamie, Waupaca, and portions of Winnebago, Calumet and Brown counties. Accreditation to provide you the highest quality of care in the Appleton, Fox Cities and Waupaca areas.